I recently picked up the Squirrel Girl and the Great Lakes Avengers collection. I'll be honest, I only bought it for one reason: It feature the Great Lakes Avengers. Also, it was on sale. And, of course, Steve Ditko! If you're counting, that isn't really one reason. 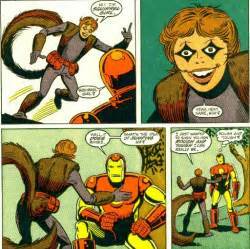 But this is Squirrel Girl we're talking about, do you think I'm going to even try to be serious here? But let me start being a little serious about Ditko. Steve Ditko helped launch the Marvel age of comics, specifically with his creation Spider-Man and Dr. Strange. Ditko even plotted most of the stories that were scripted by Stan Lee, and the combo was fantastic. Ditko is the "other artist" who launched the Marvel age, due to the unequalled brilliance of Jack Kirby, the King of comics. Some people even like Ditko better than Kirby, though even if you don't, being second to Kirby is no insult! So, anyway, when I was deciding whether or not to buy the collection, the inclusion of the Ditko plotted and drawn origin story was the decider for me. The origin story establishes Squirrel Girl as a determined though goofy character, who manages to defeat Dr. Doom and save Iron Man! It just takes guts, some luck, and a bunch of squirrels. The Great Lakes Avengers were created by my favorite comic artist, John Byrne during his run on the West Coast Avengers. (JB's WCA is okay, but not his best work. Some really good ideas, but it always seemed off.) 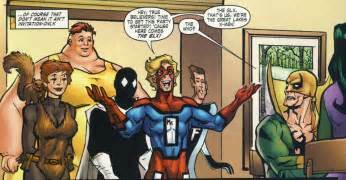 The Great Lakes Avengers were created as a team of heroes with goofy names and powers that would eventually become straight-up super heroes. But JB's run on the title was cut short and the idea never finished. So they've stayed a goofy group since. But I like them. Despite the incorrect naming. You see, they say they couldn't be the "North Coast Avengers" because the USA doesn't have a north coast. However, anyone living on the Great Lakes knows that the lakes ARE the north coast. Anyway, the name is just to sound like the JLA. At least I think so. The ongoing theme is that the GLA don't do much because nothing in the Marvel universe ever happens in the mid-west. Galactus always attacks New York for some reason. And Squirrel Girl makes a good addition to the GLA because she's extremely respected and successful at the heroing thing, whereas the GLA just kind of show up and try but never do much. Most of the stories in the collection are written by Dan Slott, who is a very good writer, and I like his stuff the best. He writes some modern Marvel books, and I don't read too much of those, but I do need to seek out more of his work. The weakest stories in the collection, in my humble opinion, involve Deadpool. I don't know why, probably because just don't like Deadpool. He does nothing at all for me. Yeah, I know he's popular and all, but I just don't get him. I did love the appearances of Speedball, another Ditko creation. I have almost all issues of Speedball's original series. It's quite fun, I think! I ordered the next Squirrel Girl collection, so if I like it I'll post more later!